I almost missed hearing this song from Alberta band The Royal Foundry, as it ended up sitting in the wrong e-mail inbox set for deletion. As much as I want to ignore the never ending press releases that still continue to be sent to my old submissions e-mail account, I keep wondering what kind of gems might slip through the cracks if I never get the correct info sent to my current submissions account. 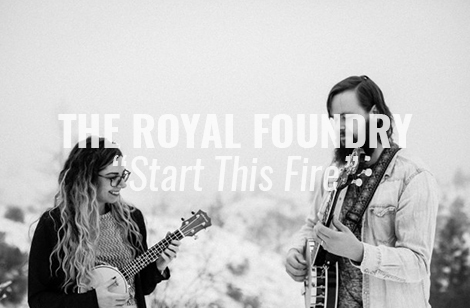 Take a listen to “Start This Fire” from Jared and Beth Salte (aka The Royal Foundry). The married couple have had a pretty successful go in wining 75k from the Peak Performance Project in Alberta, synchs in The Sports Network, CFL and Rookie Blue, radio support from NPR, BBC, Sirius and CBC, along with recently showcasing in Austin for SXSW at Canada House. The group though almost never realized all these successes, as originally they never had the intention of putting all their efforts into the band. But after the release of “All We Have” received international exposure through the John Lennon Songwriting Competition and ABC’s Rookie Blue, they knew they had discovered something special. Here is “Start This Fire” (for fans of The Strumbellas, Lumineers, Lord Huron).